I knowâ€¦I am the last Cairo-based researcher to make it to down to Bab al-Shaâ€™reyya to see Ayman Nor in action. I went last night to see what was going on. 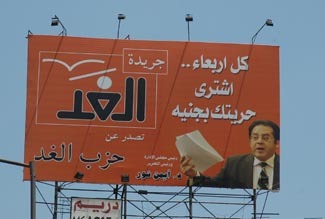 The top picture is a relatively new advertisement for al-Ghadâ€™s newspaper, which is in view (thanks partly to the orange color) from the 6 October Bridge on the way to Masr Gadida. It reads â€œEvery Wednesday. Buy Your Freedom for a Poundâ€� (18 cents). Naturally, there is a picture of Ayman Nor whose cult in al-Ghad circles is as extensive as the presidentâ€™s nationally. The second picture is an action shot of Ayman addressing some issue at the town-meeting in Bab al-Shaâ€™reyya last night. I went to al-Ghad headquarters, which is Aymanâ€™s law office in Talat Harb (above the Greek Club). I spoke to Ayman yesterday. He told me he meets the party between 5-7pm and then heads down to Bab al-Shaâ€™reyya between 8-10pm. I went with a friend around 545pm. Ayman had not arrived and the smallish room was fairly packed (I am guessing 60 people, maybe more). They were mostly professionals but there was some poor out of towners around. My friend and I discussed al-Ghad. He was having problems understanding that despite Kifaya being politically liberal, they are not liberals in the way the al-Ghad party claims to be. Kifaya, and I am generalizing and understand Kifaya should not be pigeonholed, is more Nasirist or Socialist with Islamist and liberal fringes. 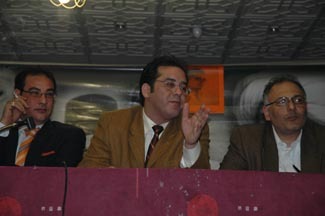 Al-Ghad is following the tradition of the al-Wafd (historically, rather than in todayâ€™s sense of the Noman Guma-run party). My friend seemed unsatisfied with my explanation. The party seems pretty infiltrated by the state. Lots of people asked exact and detailed questions about the workings of the party or generally caused a controlled commotion with non-sensical questions. These security folks did not seem to resemble poor people or well-dressed business types, which as far as I could tell comprise al-Ghad. They seemed wellâ€¦ middle-dressed as most people on the streets look. Ohâ€¦and I have never seen so many copies of al-Ghad newspaper, which was strange. It is like being in a foreign country or a state within a state. At one point, the power went out and someone entered asking if â€œanyone has any experience with electricityâ€�. It sounded more ominous than it was and we had lights after 20 minutes or so. One thing that was evident - people are getting their political interpretations from the al-Ghad leadership. In the age of satellite TV and Newspapers, people were asking questions about the amendment of article 76 and so forth because these explanations are not readily available in the press. Al-Ghadâ€™s leadership were also keen to get people to go on a bus to Sharqiya governate tomorrow to open the new al-Ghad office in the city Kafr al-Saqor. According to one of the organizers I know, it is the 10th governate that will have a party headquarters, with the plan being to have offices in all 26 governates by the end of the year. Ayman came in about 745pm. He is treatedâ€¦well like a king. He stayed for about 45 minutes. He spoke for 25 minutes and then seemed to be solving problems and mediating individually with some of the poorer members in attendance off to the side. I got to Bab al-Shaâ€™reyya around 945pm. The signs in the district are laughable. â€œYes to Mubarakâ€¦no to the Rat of Bab al-Shaâ€™reyya" Naturally there was also plenty of references to Ayman being a foreign agent. Aymanâ€™s supporters have tried to counter the attack with signs that read â€œNo to American agents. Yes to Ayman Nor.â€� Somehow none of the signs seem to make a difference one way or another on Aymanâ€™s base. Security was more concerned about my presence there than at the Kifaya protests. I was asked several questions about who I worked for. Ayman supporters tend to just say hi. I stayed for about 90 minutes watching Ayman take questions and comments from his constituents. People were showing Ayman where they were tortured, talking about his running for president, and warning him not to engage in dirty party politics by resorting to insults. Al-Ghad, the people said, should be a party of honor. Ayman listened and commented when necessary. The speakers broadcast into the streets so that security does not need crowd the hall. They did anyway with their plain clothed informers. I half-nodded as we made our way out of Nor's country and back into Mubarakâ€™s Egypt.